Snag a tub of your favorite hummus and whip up this Mediterranean Bruschetta Hummus Platter platter for a tasty pre-dinner snack that’s sure to satisfy! It’s forever my goal to somewhat “fill in the blanks” with our snacks and seize opportunity to sneak in extra nutrients we may miss at mealtime. 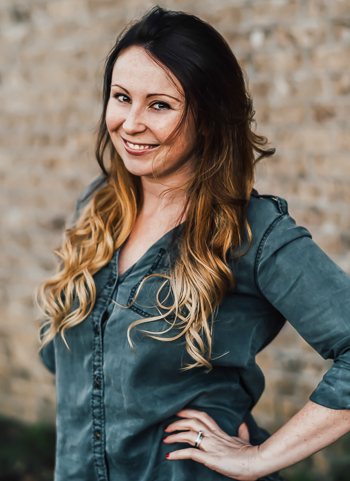 Snacks for us are typically more on the casual side, and fall into a more intuitive eating sort of routine. Some days we’re positively snack happy while other days we go so overboard when 5pm hits that our pre-dinner nosh turns into dinner itself! Often if there’s a missing component from our standard breakfast-lunch-dinner routine, I’ll try to make it up within a balanced snack. It’s always a great opportunity to sneak in some much needed lean protein (chickpea hummus and greek yogurt, I’m looking at you! ), fresh fruit, or veggies. We try to keep the focus on whole foods when possible (kettle corn counts as a whole food, right?) and serving up snack trays makes things fun and delicious! Some velvety hummus here…. crisp veggies there… and a sprinkling of carbs for good measure make for the ultimate snack plate. I like to top my hummus with a simplified version of my go-to bruschetta topping, making a quick and easy pre-dinner snack feel like a fancy Oscar party appetizer. 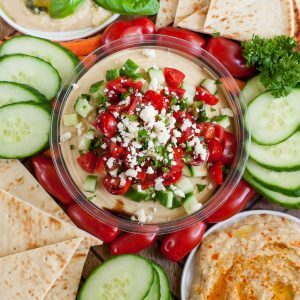 Snag a tub of your favorite hummus and whip up this Mediterranean Bruschetta Hummus snack platter for a tasty pre-dinner nosh that's sure to satisfy! FOR THE SNACK PLATTER: CHOOSE YOUR FAVORITES! 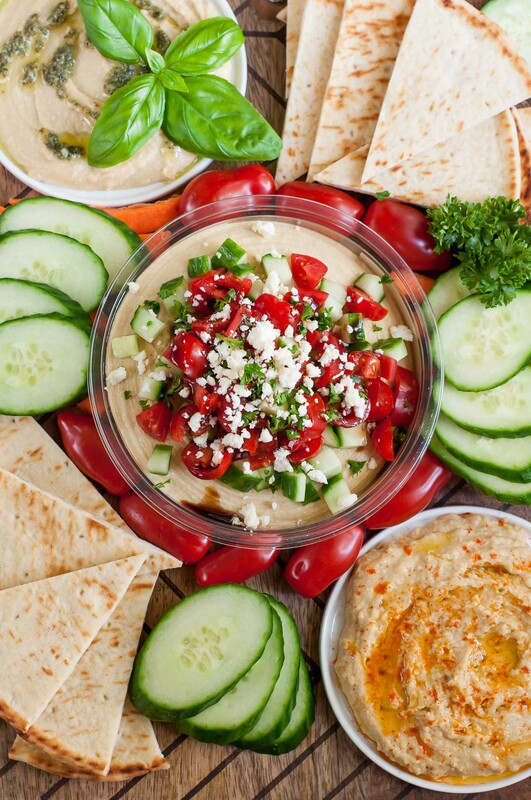 Feel free to mix and match different varieties of hummus and any veggies your heart desires! Dice tomatoes and cucumber and toss with olive oil and vinegar if desired. Pile atop a fresh container of hummus and drizzle with balsamic glaze/reduction. Top with crumbled feta and fresh parsley. 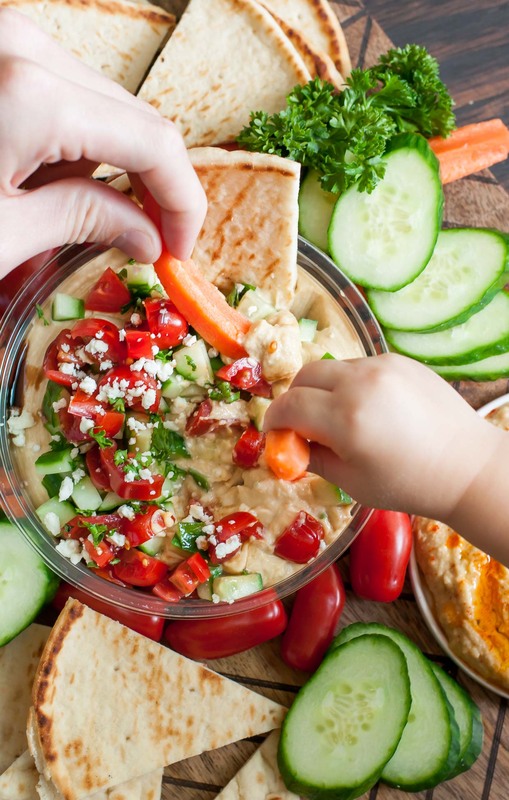 Surround your hummus with all your favorite dippers and veggies (see above for suggestions) and any other dips your heart desires! We went with Sabra roasted garlic hummus topped with olive oil and paprika and classic hummus with a swirl of pesto. Deeeeelish! 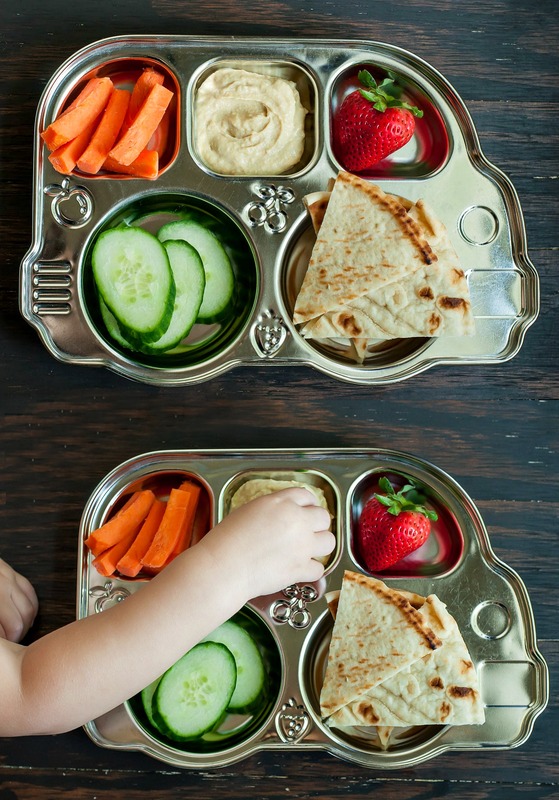 Of course that adorable little hand above belongs to my now two and a half year old chickpea who is also allllll about the snack plates! Along with the obsession with mandatory food spacing, there’s some sort of prehistoric hardwiring that flips a switch, causing a squishy baby that eats anything in sight to turn into a sassy 2 year old with more food rules than Michael Pollan. This newfound pickiness is actually a defense mechanism meant to keep little cave babies from wandering over to a poisonous berry bush and chowing down, but these days it translates into a power struggle at mealtime. Enter this momma’s lifesaver: deconstructed eats. Though she lets me heavy hand everything from pesto to curry seasoning, my opinionated toddler insists that I keep her eats as simple as possible. While prepping our meals and snacks, I simply deconstruct each element and space them out on her little school bus plate. Suddenly my offerings are deemed “soooooo yummy, momma!” and I can focus on the real fun: stuffing my own face! This pre-dinner snack also gives us a chance to pack in some extra nutrients that may have gotten snubbed during other meals of the day. AKA this is my chance to throw yet another combo of protein, fruit, and veggies at my toddler in hopes a few healthy eats make their way into her face. More often than not this is a total win, so when a certain someone decides dinner shall consist of nothing more than garlic rolls and pasta, I can rest assured that snack-time picked up the slack. Though when all else fails, we eat chocolate chip pancakes and popcorn and call it a day. If you get a chance to try this tasty Mediterranean Bruschetta Hummus Platter, let me know! Leave some love in the comment form below or tag your photos with @peasandcrayons on Instagram so I can happy dance over your creation. We make ours a little different every time based on what we have handy and it’s always so delicious! I absolutely love hummus! This platter would be great for Mother’s Day brunch! Ohmygosh such a fantastic idea Tayler, thank you! Snack platters are SO great for brunch with family and friends! Such a beautiful platter! Delicious and healthy, I love it! 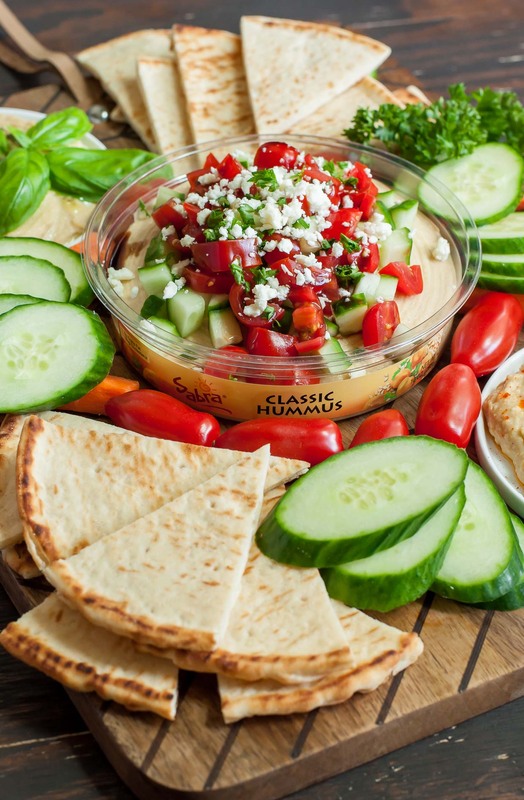 I’m loving all of the toppings for Sabra hummus floating around the web this week. You can never go wrong with bruschetta! What a delicious way to liven up store bought hummus. Looks wonderful! Thanks Michelle! Hope y’all loooove it! I like the toppings on the hummus. We go through hummus phases in our house and I think it is time for another phase. What a lovely appetizer! So colorful and full of flavor, too! Thanks Sheila! We can’t stop making it! We love hummus but do not buy it so often. This looks incredible! I am so obsessed with hummus, this looks amazing! My 3 year old is the same way! PICKY!!! I am so there with you with my 2.5 year old son. Picky, picky, picky! I NEED to get those school bus plates to see if it helps! And he LOVES hummus too, so we have to have it in the fridge at all times! So healthy…this would be great for an after school snack. Great choices in here! Hummus is one of my favorite snacks and I LOVE what you did with this one! It looks amazing! I can devour that bowl of hummus all by myself! Looks yummy! I love hummus! It reminds me of my childhood! Those trays are beautiful! Love the little hands and the recipe looks amazing! My toddler literally eats 2 things regularly: hummus and guac. Go figure those were my pregnancy and postpartum staples. At least they’re sort of healthy? Hummus and guac are staples for the chickpea too and SO healthy – I vote we should be proud of that 🙂 One thing I have really awesome luck with hummus is either blending the veggies into it (I have a pea hummus and pea pesto on the blog that were created to trick the little one haha) or taking the adult version and not offering her a bite at all. I kind of hoard it with the hubs and hope she will ask for some. Sometimes it works and she actually tries and loves something new! Other times she’s like – nice try mom go get me some black beans and guac! Call me crazy but veggies and hummus has not sound appetizing at ALL while I’ve been pregnant. I hope I revert back to my normal self pronto when baby girl evacuates! Oh man this looks so good. My mouth is watering right now. I love all of the colors and the combo of toppings. Simply beautiful!